Cement Mixers & Mortar Mixers by A&J Mixing. Call for a Demo! 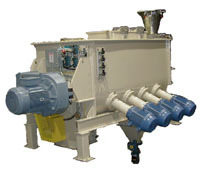 A&J manufactures cement and mortar mixers for in multiple configurations for a variety of industry uses. A&J began designing The Shearmaker™ for cement mixers, specifically, to develop red and salmon colors in masonry cement which is non-sanded, in a fixed time, and these are the colors we usually design for. There is a mallard green that takes longer, and our customers just take less production on this color as it is not a big seller. Lighter colors take less time but most customers can’t package any faster, so we work on a fixed time. We are the only company who can develop color in non-sanded material. The PHLAUER™ patented mixer rotor is ideal for customizing and introducing high shear, making it one of the best cement mixers in the industry. The mixer is divided into zones with two paddles., an outer and inner that creates randomized flow in both directions. When adding a Shearmaker, we notch the paddle face to accommodate the Shearmaker blades. Any surface area removed is added to the other side of the paddle head as to not compromise the mixing action. We just started a system that had enough Shearmakers to develop in six minutes and that is exactly the time we started up and packaged saleable material. We have installations up to 5 ton batches fully developing color in 3 minutes. Adding sand to the Shearmaker cuts time in half, or you can use half the number of Shearmakers. You will save 5 to 17% of your pigments. Thinsets and mortars without color take one minute of mix time. We had one customer get a payback of 3 months because of quality and production capability from system designed by A & J. The rotor mixes to 1/2% standard deviation and Cv of 5% with one minute of mix time.